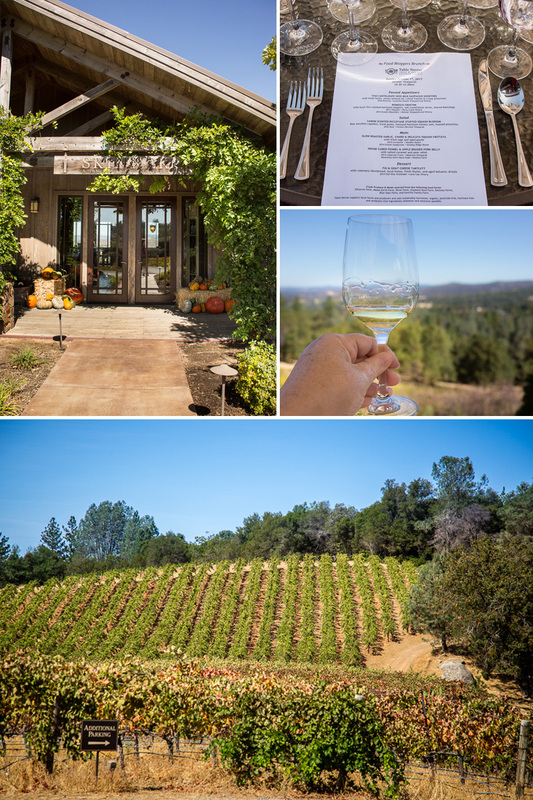 A recap of a food and sip tour of El Dorado Wine Country plus a meal prep recipe idea for mini sage and delicata frittatas that makes for a great grab-and-go breakfast. Ever eat something at a special event and think, "Man! I could eat this every day!"? Then you go home and you can't stop thinking about it. 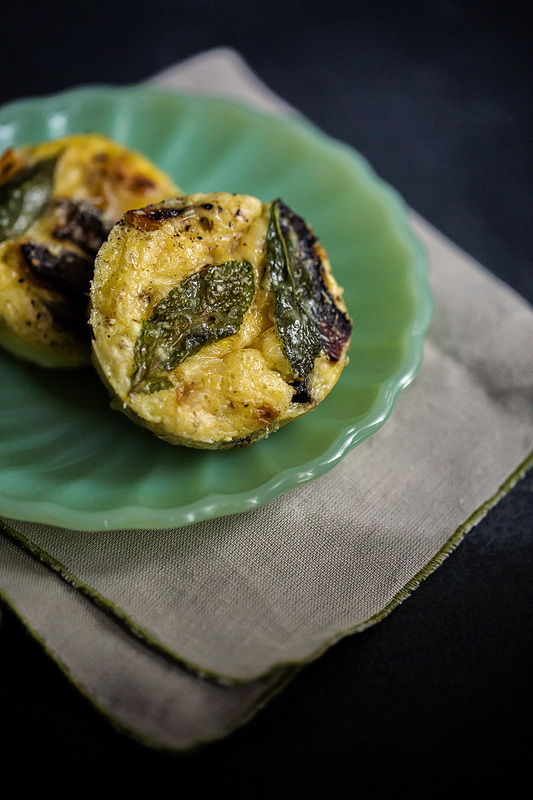 That's this mini frittata. But more on that later. 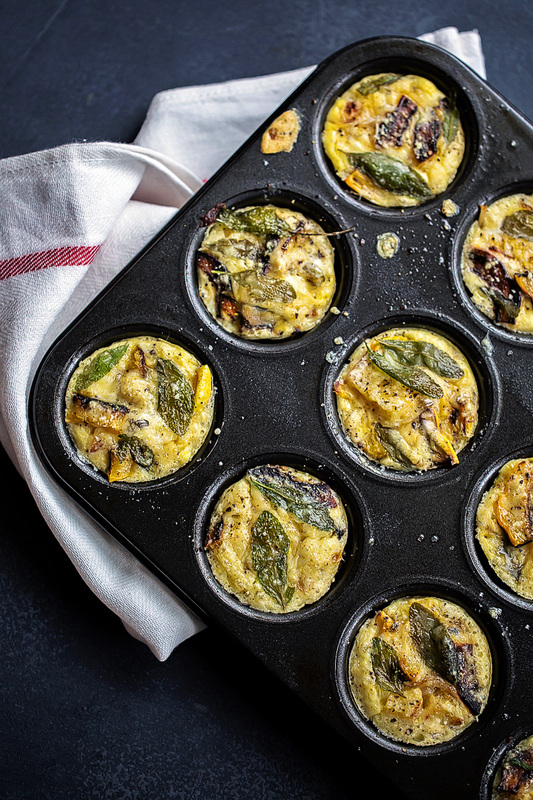 First let's chat about the event that started this frittata obsession of mine. 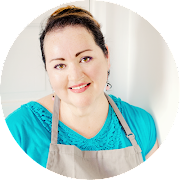 "I want everyone to feel good after eating something I've prepared," Chef Kimberly Medici, owner and executive chef of Table Nectar announced to the 25 food bloggers gathered before her. With a background in nutritional education, Medici delivered on that bold statement and then some. The scene for this glorious mid-morning soiree on a Sunday in early October hummed with anticipation as the smell of pork belly cooking in a wood-burning oven swirled around us. 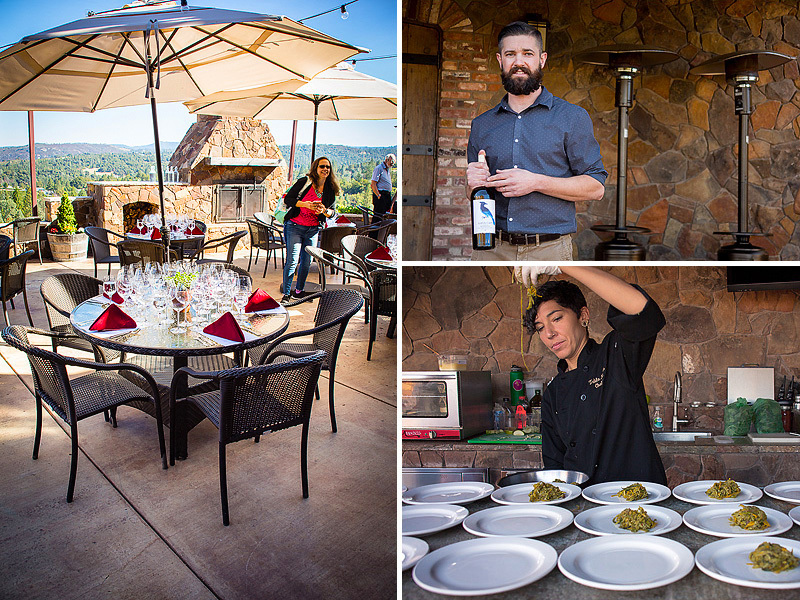 Seated on an open terrace at Skinner Vineyards & Winery in Somerset near the Sierra Foothills in El Dorado County, we were privy to rolling hills with breathtaking views. This picturesque setting proved to be a scrumptious ending to a whirlwind weekend of the annual International Food Bloggers Conference (#IFBC). The vineyard. 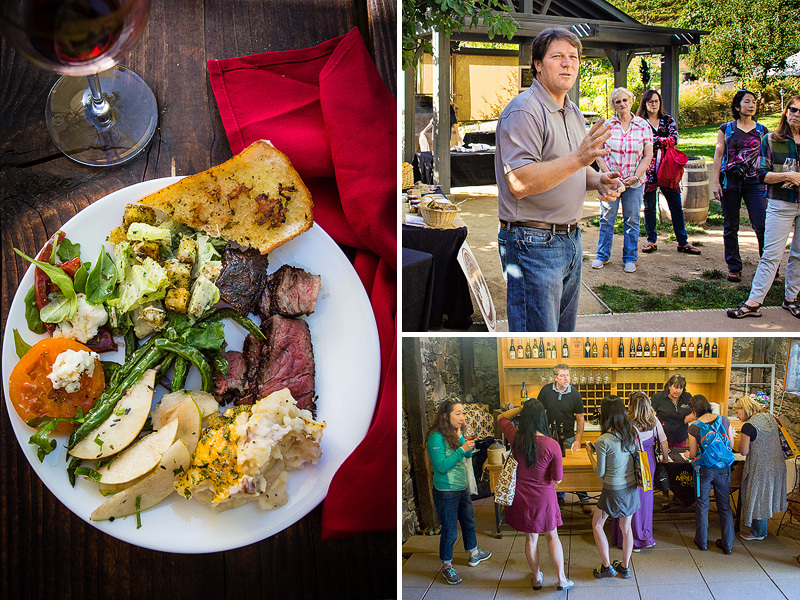 along with several other El Dorado County wineries, and Table Nectar welcomed us for a culinary farm to table/vine to table tour de force. As we meandered from table to table, sampling wine from the various wineries hosting us, we were treated to passed appetizers. 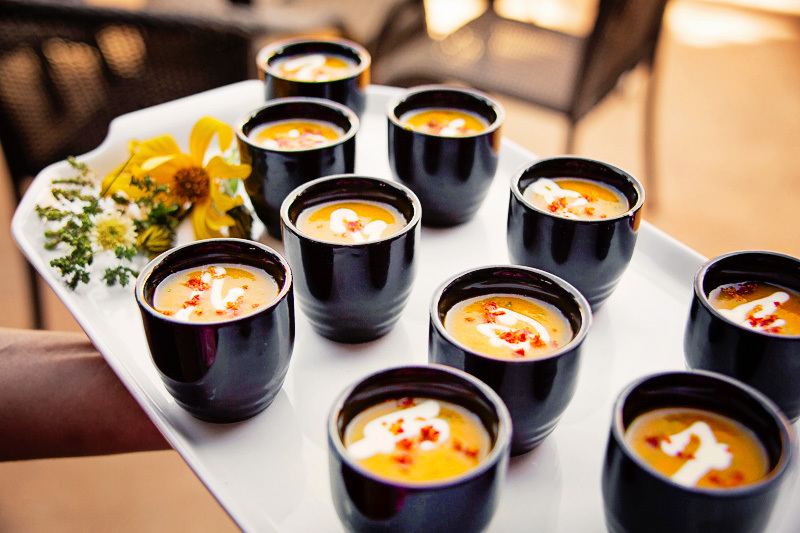 Medici began the day's feasting with these Thai Canteloupe Seed Milk Gazpacho Shooters. "I used the seeds along with the flesh of the melon to give the soup a nutritional punch," explained Medici. Finished with a swirl of crème fraiche, a drizzle of sweet almond oil and sprinkling of crispy prosciutto, it was like a Mexican agua fresca's more refined city cousin–fuller-bodied and scented with the cool, waning days of a California summer. It was paired with a refreshing fruit-forward 2016 Reisling from Gwinllan Estate Vineyard and Winery. I am a total sucker for romesco and Medici's interpretation did not disappoint. 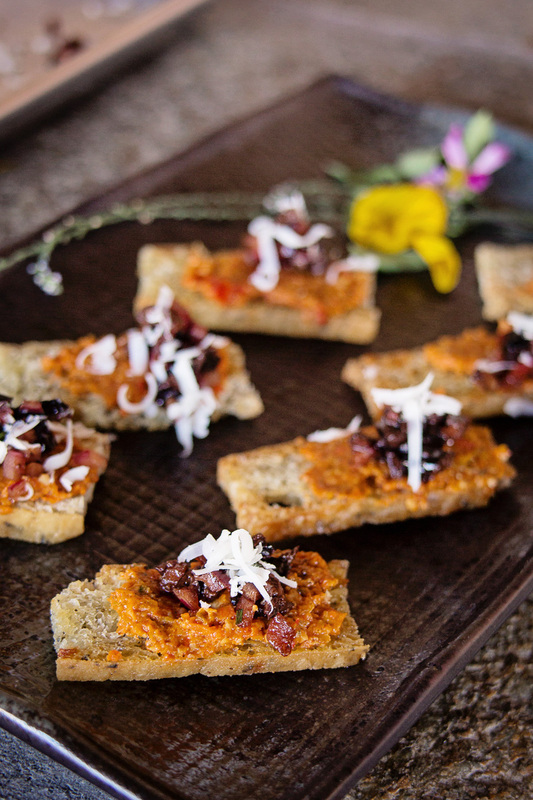 Local fire-roasted heirloom peppers provided the base of her Romesco Crostini, while salt-cured black olives cut through the rich, nuttiness of shaved Manchego. I wanted more. Truly. But I refrained. It was paired with two wines: a 2013 Viognier from Perry Creek Winery and 2014 Estate Mouvedre from Skinner Vineyards & Winery. I enjoyed both wines equally with this memorable appetizer. 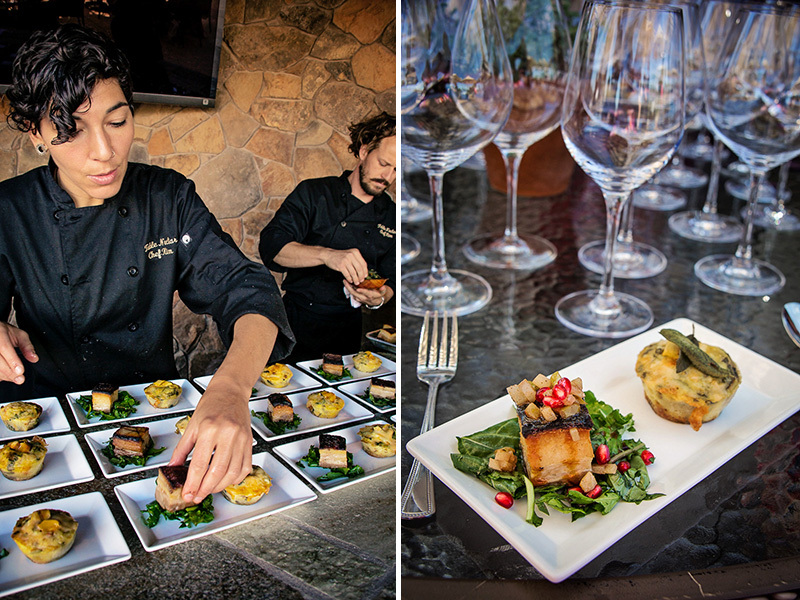 "Food and wine pairing is art meeting art," commented David Fleming (above in white shirt) of Fenton Herriott Vineyards. "First and foremost, wine is a meal enhancer. Secondly, it acts as a digestive aid. And thirdly, we drink wine for the pleasure of the company we keep." 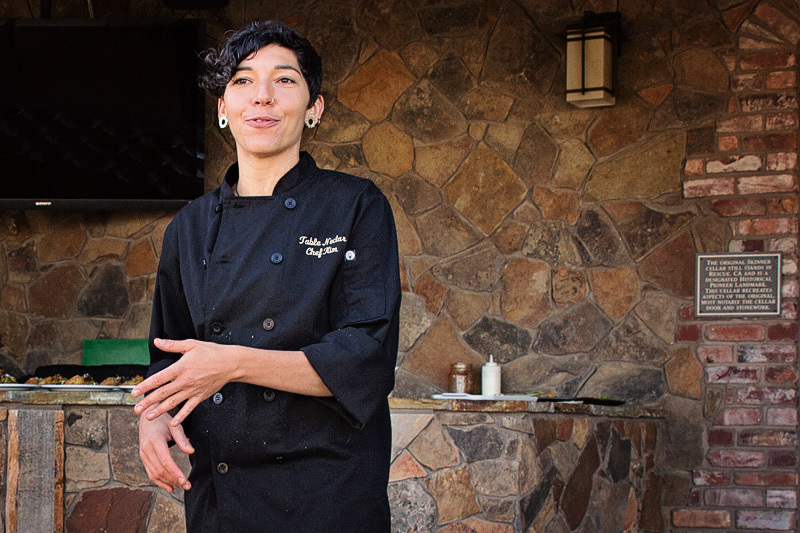 After Medici settled on the menu for the day's brunch, she sent her tasting notes to the wineries who then paired their wines with a course. Fenton's 2016 Rosé, with it's heady fragrance of pear and pineapple, paired beautifully with Medici's salad course of Lemon Scented Riccotage Stuffed Squash Blossom. Served on a bed of crunchy raw zucchini capellini enveloped in a freshly made pesto (the spiralized squash rested slightly salted overnight in a strainer in order to remove excess water, enabling it to retain a nice snappy crunch), the hero of this dish was the perfectly fried delicate squash blossom bursting with a lemon-scented combination of ricotta and cottage cheese. With honeyed heirloom tomato jam on the side (be still my heart!) 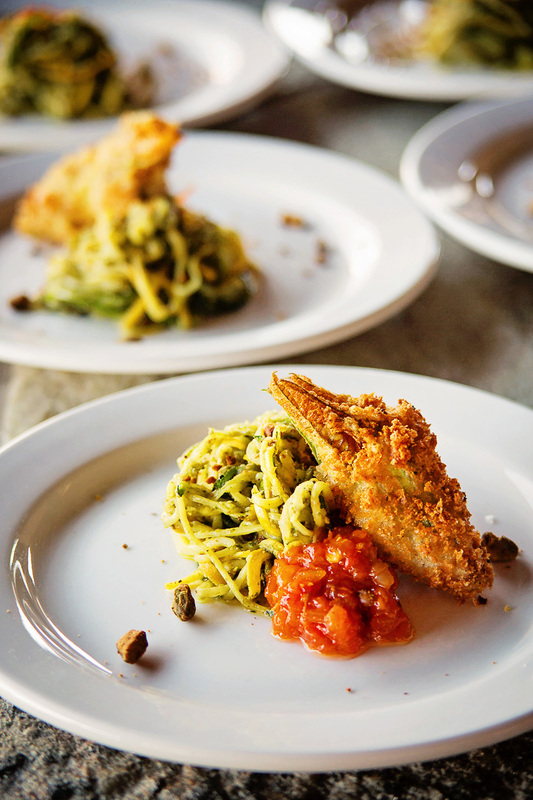 and a dusting of rough chopped pistachios, this was Medici's tribute to summer. "I love this time of year," said Medici (above) of our early October meal. "You can combine the tail-end of summer produce with the first appearances of fall produce." 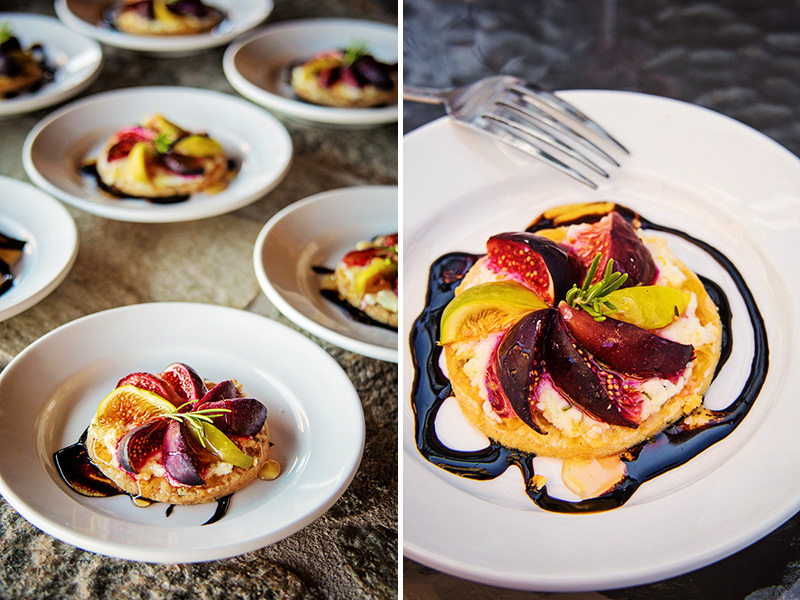 Medici's ode to early fall was next as the main course made its way to our tables. Finally, that heady scent of pork arrived in all it's caramelly-goodness: House-Cured Fennel & Apple Braised Pork Belly adorned with the sticky, unexpected but oh-so-welcomed salted caramel and a crown of pear relish topped with a scattering of pomegranate arils resembling little red gems. Such an elegant dish, I had to take out my iPhone in order to Instagram it on the spot. Were I a more ambitious cook, I would have attempted to re-create this dish rather that it's counterpart on the plate, Slow-Roasted Garlic, Chard & Delicata Squash Frittata. Don't get me wrong, the frittata did become an obsession but that pork belly was like none I'd ever had before, especially with the caramel taking it over the top. I believe it was Kyle of greateightfriends.com, one of my table companions, who noted that the frittata tasted like the perfect little bite of Thanksgiving with it's fried sage, delicata squash and creamy aged gouda. I couldn't agree more. It was paired with a super smooth 2015 Grenache from Shadow Ranch Vineyard and a wonderfully peppery 2014 Estate Sangiovese from Smokey Ridge Ranch. Both, in my opinion, equally enhanced the flavors of the dish. For the pork belly, we had the 2014 Cabernet Franc from Madrona Vineyards (I and a few table companions found it a bit soft after having had the more rounded Sangiovese). Our second generous pairing wasn't vino but rather Henrietta Stitch Hard Cider from Delfino Farms. Pleasantly surprised since I am a hard cider fan, I found the clean, slightly sweet effervescent cider a welcome counter-balance to the rich pork. Remember the rosemary shortbread I posted in October? Medici's dessert was the inspiration. She served us a Fig & Goat Cheese Tartlett. Sitting on rosemary shortbread, a smear of goat cheese was topped with slices of near end-of-the-season perfectly ripe figs. A generous pour of sweet local honey and aged balsamic swam together on the plate, providing a lovely contrast as it hit the palate. While in the midst of savoring this ambrosia, Jody Franklin, the Executive Director of Tourism with El Dorado County Visitor's Authority, our guide for the day, was desperately trying to round us up to continue on to the second half of our day of touring Historic Downtown Placerville. No one at our table budged, all of us determined not to rush the pleasure of this perfect dessert. It was paired with a 2014 Old Vine Zinfandel from Lava Cap Winery. 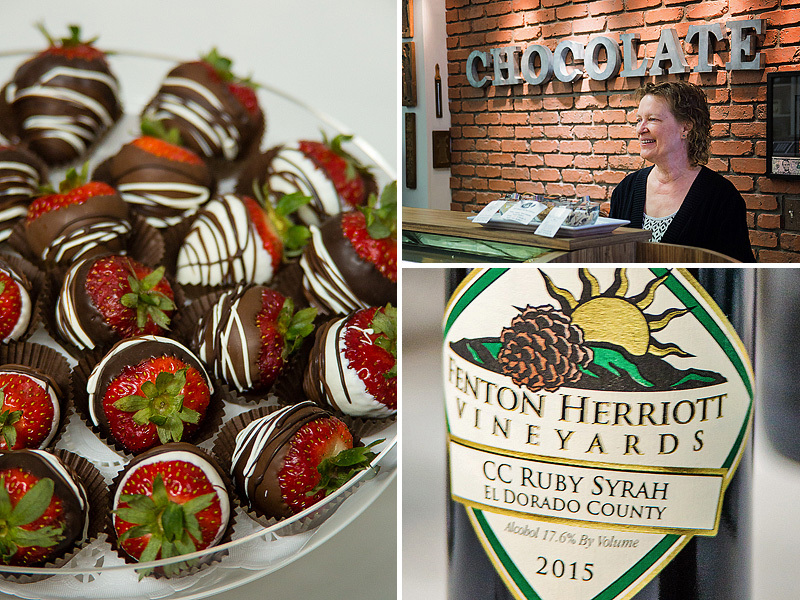 Once finally on the bus, we headed to downtown Placerville, were divided into groups and proceeded on a wine and food crawl of the main street where we partook of more local wines, chocolates, cheese, olive oils and eateries before heading back to the bus for our final destination. 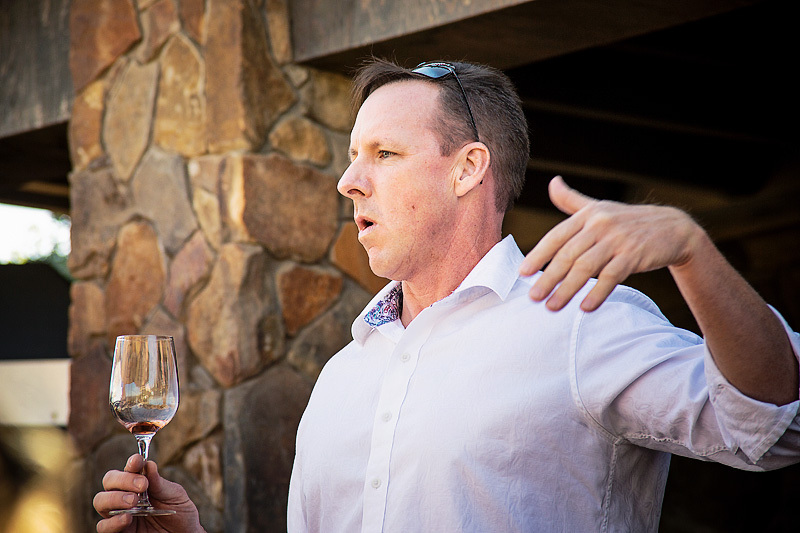 Our day ended at Boeger Winery for more wine tasting where the enticing smell of meat grilling mingled with the welcomed mustiness characteristic of an old wine cellar. The winery's Tempranillo was my choice to accompany our prime rib feast, a memorable end to my best day of the three IFBC conferences I've attended thus far. 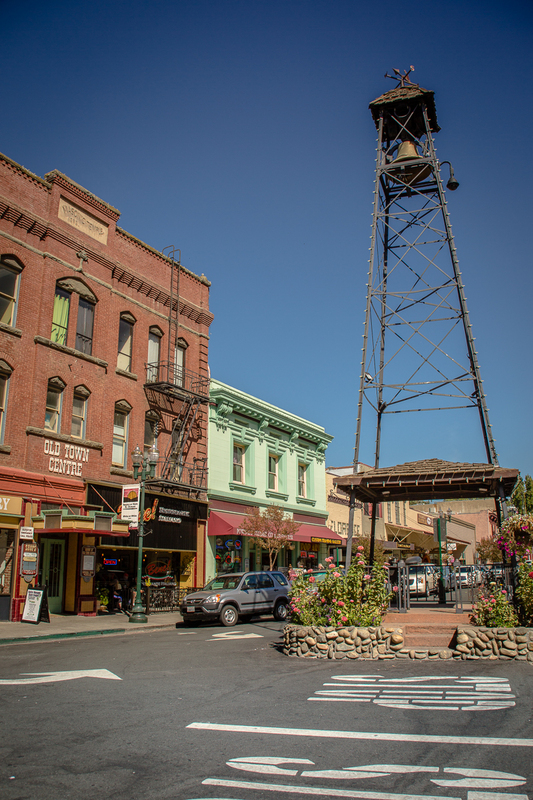 Now armed with the knowledge that El Dorado Wine Country has so much to offer, I'm already dreaming of a return trip, complete with a stay at a local B&B. Next year, IFBC is off to New Orleans, a city I've been fascinated with ever since I read my first Anne Rice novel at the tender age of 13. I've already signed up and booked my room. Auntie is joining me so we can explore the city together before the start of the conference. So, as you can tell by my lack of frequency in my posting, I've hit a bit of a culinary slump, the kind that accompanies an unsettling of my soul. And with that unsettling, oftentimes comes a reversion to a previous, more comfortable state. All this is double-speak to basically say, my adherence to a planned out, balanced approach to my diet took a back seat this year while I continued to deal with the fallout from loss and the worry of an uncertain future. To help remedy that, and knock me out of my tendency to numb, I'm once again attempting to plan out my meals, arming myself with choices that are better for me. This includes a solid homemade breakfast, difficult for me to do when I'm rushing out the door in the morning to get to work on time. Thinking back to my day touring El Dorado, I couldn't get the frittata out of my head. Using the taste memory of Medici's frittata, I set out to make my own interpretation of this easy, eat-on-the-go meal. Several go arounds became my staple morning ritual while I searched for a balance of flavors that suited me. I love portable foods, and this one has helped to get me back on track in the mornings. I hope you give it a whirl. Don't rush browning the onions, their sweeter, richer flavor play off the roasted squash nicely. I used whole wheat bread as well as rosemary bread. If you can get your hands on a crusty loaf of rosemary bread, you'll definitely take these babies over the top. Yum. We pick up our rosemary loaves from Costco (2 loaves for $5!). When whisking the eggs, be very gentle so you avoid whisking in air. Over-aerated eggs will rise dramatically while baking then deflate as they cool, creating a tough texture. Also, as for prepping the muffin pan, I've buttered, used oil, used cooking spray and used baking spray. Baking spray gave me the best results. I'm not one who likes frittata "crusts" as I'm not at all a fan of even slightly browned eggs. The baking spray kept the eggs from sticking while not adding excessive browning to the edges. Preheat oven to 375 degrees Fahrenheit.Wash and dry the squash. Cut in half length-wise, scoop out and discard the seeds. Slice squash into half moons and spread the slices out in a single layer onto a sheet pan. Drizzle with 2 tablespoons of olive oil adding a sprinkling of salt and pepper, to taste. Toss to coat then bake for 20 minutes, flipping once halfway through cooking time. Remove from oven, allow to cool enough to handle, then cut each slice in half; set aside.While squash is roasting, add 2 tablespoons of oil to a skillet on medium low heat. Carefully drop in the onions and sauté until lightly browned but not burnt, about 10-15 minutes. Remove to a plate and set aside.Line a plate with a paper towel. Add a tablespoon of olive oil to the skillet. Once warm, add some of the sage leaves about a half inch apart. Cook for 30 seconds then flip and cook for an additional 30-40 seconds, removing them to the towel-lined plate. Repeat until all leaves have been fried.Add a tablespoon of olive oil to the skillet. Once shimmering, add the bread cubes and cook on all sides until golden. Remove from heat.Crack eggs into a small bowl and break the yolks with a fork. Add the milk and spices then scramble the eggs gently, trying not to incorporate too much air.Spray the muffin pan with baking spray. Distribute the croutons evenly between the muffin cups then follow with the onions, squash, gouda, and then the egg. 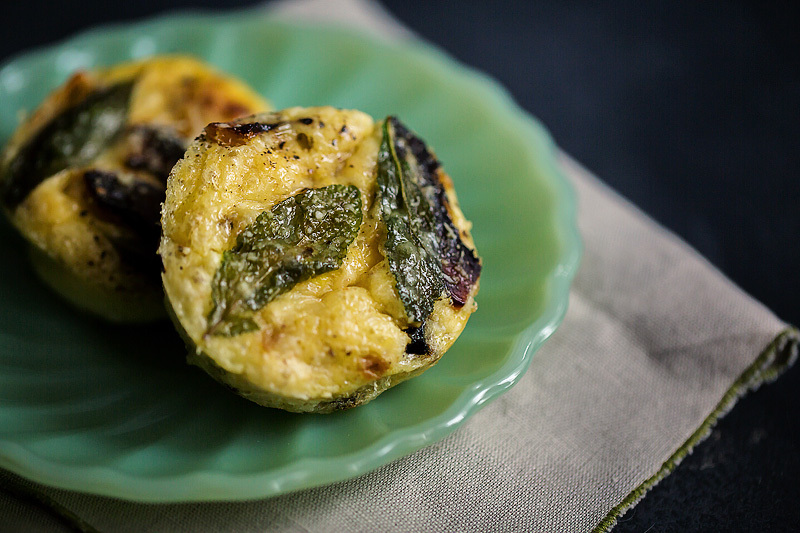 Top each frittata with parmesan cheese and two sage leaves.Bake for 20-25 minutes or until the centers are just set but not browned. Allow to cool in the tin for 5 minutes then carefully remove to a wire rack to fully cool before storing in an airtight container. Will keep in the refrigerator for up to 5 days. FTC notice: As a Citizen Blogger for the International Food Blogger Conference, I received a reduction in my registration fees in exchange for agreeing to write a minimum number of posts before, during or immediately following the conference, topic to be of my own choosing. This is the second of those posts. As always, photographs and opinions are wholly my own.